Non-surgical, non-invasive skin tightening on the face is a great way to have a facelift without the need for incisions. The advanced devices that we use at Natural Foundations can combat the signs of aging, including lax skin, wrinkles, and sagging such as the formation of jowls. Start now to stop aging in its tracks, and you have the ability to always look younger. We will recommend the best treatment for you based on the condition of your skin and what you wish to correct. The Venus Legacy device use NanoFractional Radio Frequency and SmartScan technology, as well as pulsed magnetic fields, to tighten the skin. Gentle heat causes the skin to safely contract and tighten for a more youthful look fast! The Venus Legacy combines VariPulse™ technology with 3D™ MP2 energy to give you a deeper treatment that stimulates circulation and immediately plumps your skin to reduce lines and wrinkles and make lax skin firmer. Most people need about 6 treatments on the face once a week, and they begin to see results after the third treatment. Each of your appointments should take less than a half hour. Venus Legacy is not painful. It merely feels like a hot pulsing massage on the face. Most patients experience facial redness for about an hour after the treatment. The results have been shown to last 18 months or longer, and they can be maintained if treatments are done quarterly. The Venus Viva device can smooth acne scars and diminish their appearance. A “fractional” laser, the Venus Viva targets only the skin that has been damaged, leaving the surrounding skin untouched, allowing for a faster recovery. Most patients need 3-4 Venus Viva treatments every 2 weeks, although this can vary depending upon the degree of skin tightening you want. We apply a numbing cream to your skin a half hour before the Venus Viva Laser device is passed over your skin, and the treatment itself takes less than 30 minutes. No downtime is required after Venus Viva, but you might experience some redness and discomfort similar to a mild sunburn. This does not usually last for more than a day and a half. Your skin will be more prone to sunburn after your treatment, so please use sunscreen when outdoors. We can also recommend skin care products to speed healing. See our Products page for more information about the product lines we use. Microcurrent treatment is a non-invasive procedure that tightens the skin through gentle electrical stimulation. It promotes collagen and elastin production, while also increasing blood circulation and cell regeneration, for an overall more youthful look. As the collagen and elastin is produced, you will continue to see skin tightening improvement for months after your treatment. Microcurrent actually “reeducates” the fine facial muscles as a tiny electrical current is administered through two Q-tipped probes and applied to improve muscle tone and tighten the skin. All you will feel is a gentle tingle, and no harm is done to the skin. A series of treatments are usually required over a period of months. Your treatments will take 60-75 minutes, and you will begin to see results after the very first appointment. Thereafter, booster treatments every few weeks (which take a shorter time) are necessary to maintain your results. V-Shape 3 Generation RF Therapy is FDA approved technology that uses radiofrequency for skin toning and tightening, which is based on energy instead of laser light. 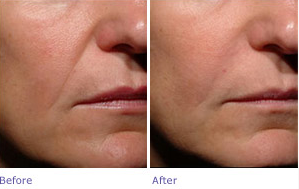 Using patented radiofrequency (RF) technology is the most effective way to target sagging skin today. The radiofrequency technology supercharges water molecules in your skin, which in turn cause a thermal reaction similar to warm ironing of the skin. 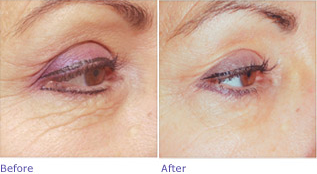 Results may vary and are often visible immediately after the first treatment. V-Shape Ultra delivers ultrasound waves directly into the problem areas below your skin’s surface. As a result, fats cells begin to rupture and melt away while leaving the surrounding areas unharmed, such as nerves, blood vessels. The terminated fat cells will not grow back, meaning that stubborn fat in the treated areas are gone for good. If you are ready to get started with Skin Tightening treatment, call Natural Foundations in Capitola at (831) 325-0202. Call now for a complimentary consultation.